For those with mobility issues, this is our most accessible condo. Arranged for convenient movement both inside and outside, B1 has direct access to the upper parking lot for easy loading/unloading. 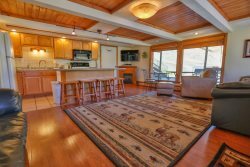 This end unit on the "quiet side" of the building provides you with beautiful views of the Roaring Fork Valley, and you can even spot skiers and boarders on the Sunlight Extreme trails.